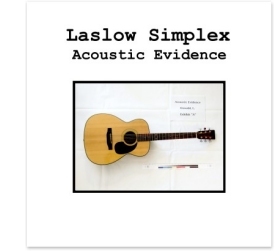 Just Released - Laslow's new concept EP, "Acoustic Evidence"
"Simplex knows how to write a good story line, and knows how to write lyrics that closely play off one another." "...like a weird, trippy jam between Hank Williams, Captain Beefheart, Neil Young and Tom Waits." "There’s something in the rhythm and lyrics. Okay pretty much everything..."
On November 22, 1963, the world changed when Lee Harvey Oswald shot President John F. Kennedy from a 6th story window of the Texas School Book Depository in Dallas. Oswald himself would only live two days longer, gunned down by local nightclub owner Jack Ruby. Nearly 50 years later, Laslow Simplex takes a dangerous journey through the mind of Lee Oswald - high school dropout, failed Soviet defector, schoolbook warehouse stock-boy, and presidential assassin. The six songs on this EP were written in a single weekend after a visit to Dealey Plaza - standing on the grassy knoll, looking at the window where Oswald aimed the rifle and the "x" in the street marking the strike of the fatal shot. Oswald left behind no explanations; he died before he could tell his story. If his ghost really did haunt some dark Texas bar, would he offer this as his acoustic evidence?